How to become a celebrity overnight? Simply, make a world cup football prediction and wait till it turns out to be right. But why did it really happen with only John? 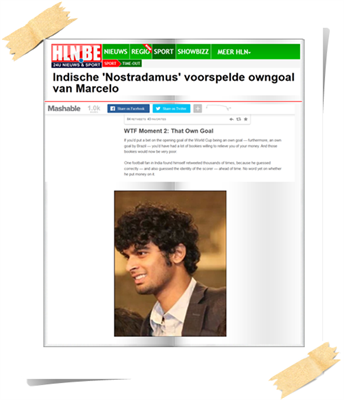 It's much interesting to know the story of a 21 year old young malayali from Mumbai who shot to fame in few hours after predicting the World Cup Football match accurately. 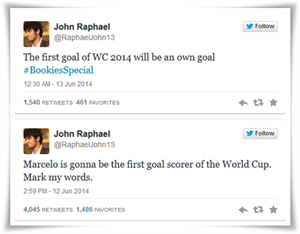 John Raphael an economics graduate of St Xavier's College, Mumbai with the Twitter handle @RaphaelJohn13 tweeted an hour before the Brazil - Croatia match on Thursday that the first World Cup goal would be a self made one and would be from the legs of Brazilian player Marcelo. After his prediction went right, his "followers" increased by a thousand in less than 12 hours and made news in Belgium and trended heavily in Manchester, United Kingdom. Popular news sites have also reported about John which really elated millions of football fans. As the freaky prediction went right, John is now being called "Nostradamus" and the "octopus for FIFA 2014". But how did the prediction happen? Being an ardent fan of football, John was following the game for a long time. Being the first match of the world cup, the prediction got noticed. Initially he thought that Mercelo will score for Brazil, but later felt that it was going to be for Croatia and tweeted it online. Much interestingly, as the tweet also carried #bookiesSpecial, others started using the same hashtag to promote their predictions. If you dream big and hopes up to follow him and bet your money on his forecasts, things would not go right. John doesn't have planned to predict for all the matches, he would follow his gut feeling and Tweet if only felt something strongly. Being not a supporter of any country for the world cup, John is a die-hard fan of Manchester United. FIFA World cup football, football world cup mania in Kerala, Malappuram football, Kerala football posters, Malayalam football posters.